The "Dine 4 Brain Aneurysm Awareness" event was a great success. We had well over 100 kids and adults join us and all had a wonderful time and a great meal. 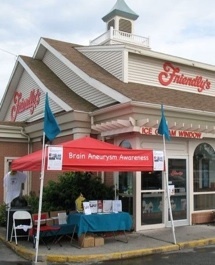 $282.00 was raised from the meals served by Friendly's Ice Cream. From the general public we made contact with 7 or 8 folks that had a personal experience with Brain Aneurysms, either survivors themselves or deceased family members. Many hugs were seen. And we chatted with several people from the medical community. Informational brochures and symptom magnets were handed out and our awareness sneaker signs were read by many. 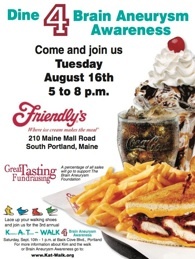 "Brain Aneurysm Awareness saves lives"
We look forward to hosting this event several times a year in the future. THANK YOU to Nancy Stultz, the Stultz family, Friendly's Ice Cream, and all that joined us to make this event possible.